MobileIron only officially support QR codes generated through the MobileIron Provisioner app. While the below works and has been extensively tested, do not expect MobileIron to assist with the manual creation of QR codes outside of the official application! When taking a factory-reset device out of the box, the Android setup wizard presents a “Welcome” screen. While this can and does vary on exact wording and placement, normally tapping on the “Welcome” text or a similarly placed logo 6 times in the same place will invoke the QR setup process. Once invoked, the device will request a WiFi connection, perform a few initial checks, automatically download a QR reader and start it, ready to be presented with a QR code. From there on the process is similar to that of the NFC and wireless token enrolment methods, with the setup wizard being largely skipped and the MobileIron agent instead presented for enrolment of the now work-managed device. MobileIron Core 9.2 or above, where Android Enterprise (then Android for Work) was introduced. In 2018 MobileIron switched from package checksum to admin signature checksum, meaning it’s no longer necessary to generate a package checksum unless you wish to do so for the sake of experimentation. The admin signature checksum will not need to be updated, and thus the MobileIron Core and Cloud code examples in the next section may be used as-is. The below code requires an APK URL and checksum. While the URL is likely to remain the same, the checksum will change when the package is updated. If the checksum fails, the device will prompt to perform a factory reset which adds a delay to provisioning. It may be possible to avoid this with a device reboot, however it’s always best to validate the checksum matches that of the APK before attempting to generate a QR code and provision devices. 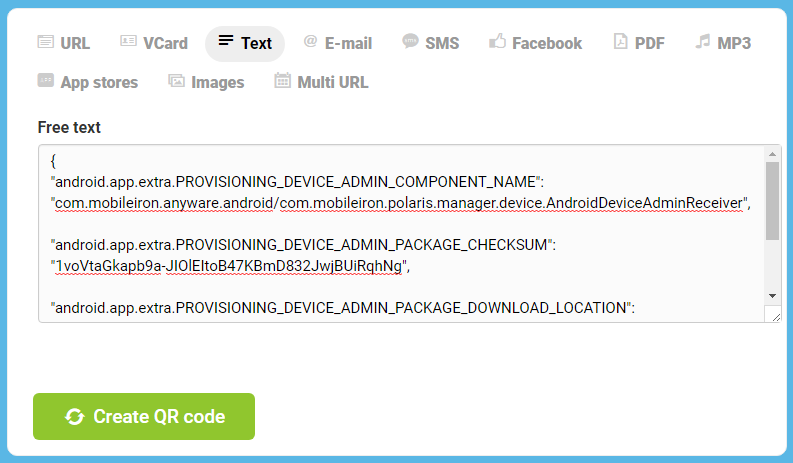 For more information about this raw code, read MobileIron unofficially supports QR provisioning for Android Enterprise work-managed devices, this is how I found it. No special tools are required for generating MobileIron-compatible QR codes. As long as the chosen QR generator supports free text, any can be used. For the codes generated in the linked post above I used qr-code-generator.com.